A network of small and informal trails weaves its way through this remnant patch of deciduous forest. 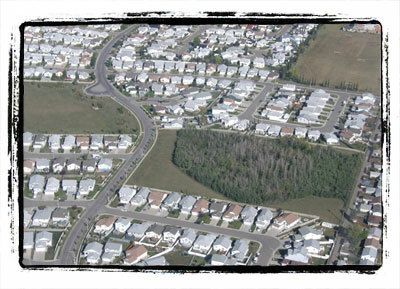 These trails make it easy for inquisitive children and interested nature viewers to explore this patch of trees. A search would yield a surprising diversity of vegetation based on the size of the treestand. The high level of diversity can be largely explained by the variation in the age of the trees. Some areas along the edge of this treestand are relatively young and support different plants compared to the area of older trees towards the centre. The change in the composition of species over time is a process called succession. 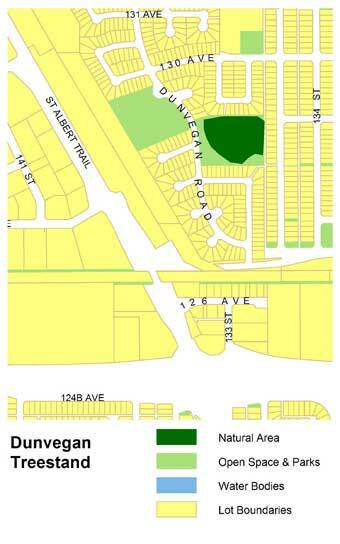 The Dunvegan Treestand is located along the east side of Dunvegan Rd. just north of 128 Ave. Greenway access is also provided from the south side of the treestand (128 Ave.) and from the north side of the treestand (129 Ave.). Several informal trails can be accessed that traverse through the treestand. The Dunvegan Treestand has a great diversity of plant species creating a variety of habitat types that support a wide assemblage of birds and other wildlife.